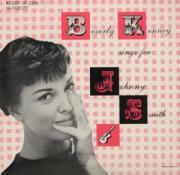 Born in 1932, Beverly Kenney emerged during the mid 1950s as a promising young jazz singer but died at a tragically young age of 28, leaving only six albums behind. After a brief stint with the Dorsey Brothers' band in 1955, she made her debut album with guitarist Johnny Smith in the same year, and her last in 1960. Entirely self-taught by "really listening" to Mel Torme, Frank Sinatra, Ella Fitzgerald and Billie Holiday, Kenney demonstrated real singing talent: excellent vocal control, clear diction and deep understanding of lyrics. Her soft and slightly husky voice is somewhat lightweight but can be very charming. She may be largely forgotten in the US, but there is a strong following in Japan and many of her long out-of-print albums are reissued in that country.